The US is warning its citizens that Europe is facing a "heightened risk of terror attacks" at Christmas markets and other seasonal holiday events. The US State Department has issued a new travel alert telling US citizens to "exercise caution" while travelling to Europe, especially while attending large festive events, visiting tourist sites, places of worship, restaurants and hotels and using public transport. French authorities arrested seven people on Monday November 21 after anti-terror raids in Strasbourg and Marseilles, Interior Minister Bernard Cazeneuve said. The eight-month-long investigation stopped a "new terrorist attack that had been planned for a long time on our soil," Cazeneuve said during a news conference in Paris. 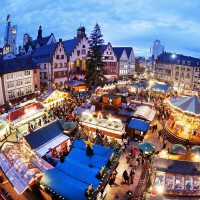 Christmas markets have already begun in cities including Vienna, Hamburg, Budapest and Prague too. These are a major draw which attract tens of thousands of visitors every year. The US State Department said it had "credible information" that Islamic State of Iraq and the Levant (Isil) and al-Qaeda were planning attacks and focusing on the "upcoming holiday season". The warning has been released a week after the one-year anniversary of the 2015 Paris attacks, which killed 130 people across the French capital. It said: "US citizens should also be alert to the possibility that extremist sympathisers or self-radicalised extremists may conduct attacks during this period with little or no warning. "Terrorists may employ a wide variety of tactics, using both conventional and non-conventional weapons and targeting both official and private interests. If you are travelling between countries in Europe, please check the website of the US Embassy or consulate in your destination city for any recent security messages." The statement did not name any specific countries but did note that terror attacks in Belgium, France, Germany, and Turkey have taken place over the last year. The news came as research by Allianz Global Assistance found a "significant decline" in the number of US travellers planning to visit European cities affected by terrorism. The travel advisory runs until February 20, 2017.